About Corporate Computer Centers, Inc.
Corporate Computer Centers is one of the oldest continually operating computer resellers in California. Founded in 1988 as Hot Chip Computer, we changed our name to Corporate Computer Centers in 1994 to focus on the business to business and Enterprise market. Corporate Computer Centers leads the industry in service and support. We have made the San Diego Business Journal's "Twenty Largest Area Computer Resellers" list multiple times. We have also been featured in the San Diego Business Journal's list of "Fastest Growing Privately Held Companies" on numerous occasions. In 1998, Corporate Computer Centers, Inc. was awarded the "Corporation of the Year" award from Neighborhood House Association, a non-profit organization which administers San Diego's Head Start program. In mid 1999, Corporate Computer Centers built a new 13,000 square foot building in the Miramar area. Our new facility was designed from the ground up to our exact specifications and allows us to meet the needs of our customers in a clean, professional and controlled environment. Our facility also features a 40,000 watt solar power generating station installed on the roof. This system provides enough power to run the entire building, reducing electricity consumption and the production of waste from conventional power plants. 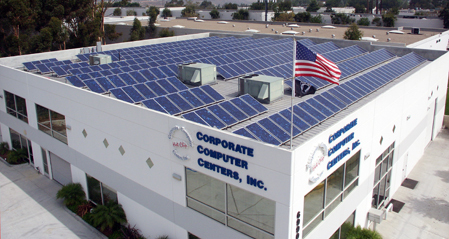 Corporate Computer Centers is a member of the EPA's Green Power Partnership Leadership Club. Corporate Computer Centers’ first priority is customer service. We will always do everything in our power to ensure customer satisfaction. It is the cornerstone of our business and the primary reason for our success. Copyright © 1994 - 2015. Corporate Computer Centers, Inc.